This Harvard undergrad's senior thesis on CDOs (Collateralized Debt Obligations) and their role in the credit crisis was recently mention in Deal Journal. It the doesn't say anything new, but it does an impressive job of marshaling facts about the CDO markets - the author hand-collected a data set on over 700 CDO deals, and provides a wealth of information. What's more, she did it within a semester's time. I'm here in Dayton at the R.I.S.E. forum (a very large student-focused conference on the investment world), and I'm waiting for my students to get their stuff together. Since I've been here several times, I'm skipping the lion's share of the sessions and mostly just catching up with friends. Last night, after making the obligatory pass through the Oregon District (a very funky place, with everything from art galleries to martial arts dojos (practicing with katanas) to peep shows), I went to my room to work on class stuff - my students are getting a video presentation on MBS pass-throughs to watch while I'm gone. In the meanwhile, since it's spring training season, I give you this classic but still funny piece (complete with a mention of a lesser-known greek figure about 2:17). Just had a stress test (there was a minor irregularity in an EKG at my recent physical). I'd been putting in a lot of seat time (on the bike) at the gym up until about 3 weeks ago when some other problems had me stopping altogether, so I wasn't too worried. But my doc ordered the test just to be sure. Unfortunately, they shave parts of the chest to make sure that the leads for the EKG have good contacts. And I am, shall we say, a bit on the hirsute side (kind of like saying Ed "Too Tall" Jones is too tall). So I came home with a few patches missing. I took the clippers to the rest, and now I have nubs. TMI, for sure. But I'm all about the sharing. I now have more sympathy for my wife. Here's a pretty good "brief" memoir Eugene Fama wrote for a journal. I say "brief" because it runs pretty long - but that's to be expected given all the work that Fama has done. To get started, each "team" got a name and a brief description as to why it was included in the tourney. Chicago Alumni and friends then participated in on-line voting in Autumn 2009 to select their personal or preferred outcomes for each of the match-ups, which moved from the "Sweet 16" to the "Elite 8," and then to the "Final Four" and the ultimate winner (that is, the person or thing most responsible for the financial crisis and recession). With permission from the University of Chicago Magazine, the AEA was pleased to offer its members a chance to fill out their own brackets and submit their entries and pick an ultimate "champion." Below you will find the four named regions, the four competitors in each region, and a brief introduction to each team. When Jonathan and his sister were young, I learned to do the voice of many of the sesame street characters. Their favorotie was definitely Cookie Monster. FIrst, he's got a pretty cool voice (I can only do it for a while before my throat gives out, but it's worth it). Second, he has imulse control issues. THird, he's a bit of, shallwe say, a MORON. In other words, a typical guy. 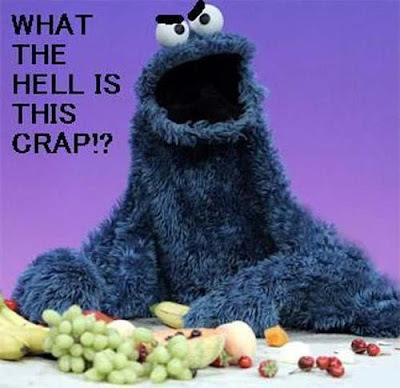 But lately, they've been trying to rehabilitqate him by making him eat more fruits and vegetables (he now sings " A Cookie is a Sometime Thing". Were Jonathan here, he'd agree with the unknown daughter - "Dad, that's just wrong in so many ways". I still suspect some One Flew Over The Cuckoo's nest type action - look for the scars.